America. 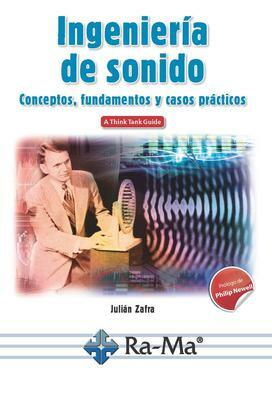 A research and writing work during the last two years by sound engineer Julián Zafra, resulted in the book Engineering of sound, concepts, fundamentals and practical cases, with competition topics for America and Spain. 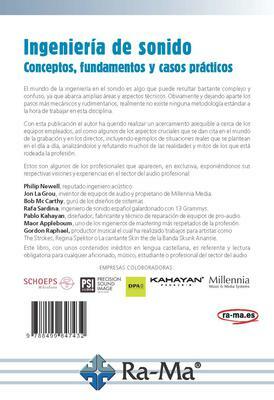 Julián Zafra highlighted to AVI LATINOAMÉRICA that the publication includes aspects such as theory about sound, recording studio, recording studio equipment, live sound, equipment that intervenes in a recording, professional audio systems, among others. "This book began spontaneously and without marketing scope. More like the idea of ​​writing a book in Spanish with an Anglo-Saxon content, with information and exclusive interviews with other professionals in the professional audio sector around the world. As a result of the agendas and volume that are acquiring these, is when I have decided its structuring and selection for publication in commercial areas. The idea was to make a book without becoming too dense in the different aspects of the professional audio sector, "he said. The publication is intended for both the professional and the amateur, musician or anyone who likes the world of audio and can read a book "digestible" without falling too densely as with other publications so specific, as is the world of sound engineering. Philip Newell, renowned acoustic engineer. Jon La Grou, inventor of audio equipment and owner of Millennia Media. Bob Mc Carthy, guru of systems designs. Rafa Sardina, Spanish sound engineer awarded with 13 Grammys. Maor Appelbaum , one of the most respected mastering engineers in the profession.